The thumbnails at left and below should click and expand into a handy dandy little guide to help you get around our fair Rose City. It is referred to, somewhat unfortunately, as the cheat sheet. Broadway drivers carry them. I believe Radio Cab prints thier own version. It's no secret internal document or salacious peek into the world of the cab driver. All it is, is a list of streets in Portland, and thier 'block numbers'. It is a bare-bones index listing of streets, a basic textual description of the city's skeletal structure. 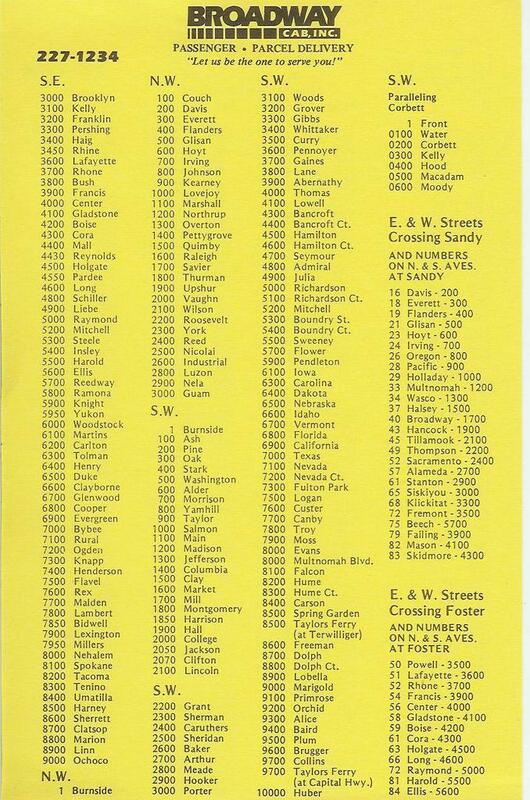 To understand how to communicate with this list, meditate well on the boldface subtitle below the Broadway Cab logo: Numbers at Intersecting Streets. Take side one, the section headed "N.E". This list starts with 1 Burnside, then continues 100 Couch, 200 Davis, 300 Everett, 400 Flanders, 500 Glisan all the way to 7500 Lombard. Now picture yourself heading north on NE Grand Avenue from Burnside. You've just crossed the intersection of NE Davis Street. You're going north, and if you've paid attention to the lessons so far, you know numbers are increasing, therefore, you know you're entering the 200s on NE Grand. If you're traveling toward a baseline, say southbound on NE MLK Jr Blvd, the numbers go down; if you're crossing NE Davis going south on MLK, you know now you are leaving the 200s on NE MLK. The whole thing is just that simple. Now you know how to interpret those block number tabs on the street sign: when you're at NE Glisan and 60th, say in front of Biddy McGraw's, and you're telling someone where you are, you, dear God, don't say you're at "500 NE Glisan St". You are now enlightened. Carry this gem whereever you go in Portland, Glisanhopper, and don't get lost. Even though the layout and design are rather straightforward, there are a few points worth noting. For instance, the NE list ends at 7500-Lombard, which as can be easily seen from the map, is hardly the edge of the city. For streets north of Lombard, check the section labelled "N" and subtitled "Parallelling Lombard". 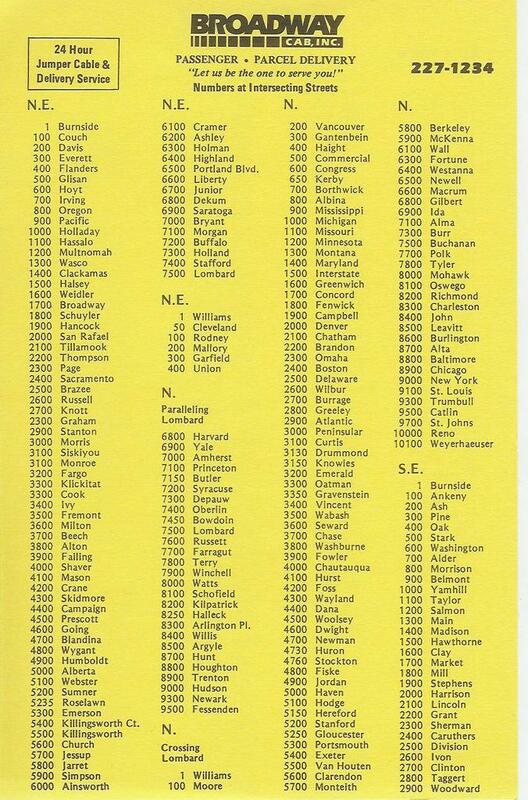 Find 7500-Lombard in the list–a few of the streets from 7600-Russett north have NE counterparts. As for the streets south of Lombard and parallel, most of those streets are unique to the peninsula area. However, NE streets have N counterparts as far east as Greeley Avenue, so the NE block numbers apply there. Just after the end of the long NE list is a shorter NE list with 5 items–1-Williams, 50-Cleveland, 100-Rodney, 200-Mallory, 300-Garfield, 400-Union. These are actually named Avenues. From the Rose Quarter area north to Columbia Blvd, instead of numbers, the Avenues in that area have names. These are thier intersecting block numbers. The N (Crossing Lombard) list serves the Peninsula as well as areas south–out to about Interstate, N named Avenues extend as far south as the Rose Quarter (notably Williams and Vancouver). Even Zero Hundreds are accounted for-but that list is very short as well, leaving off at 0600-Moody. The list, then, isn't all-inclusive. It includes the straight streets only (a listing including all the curvy streets in Healy Heights, Council Crest, etc, would be a book, providing it could be so designed as to communicate clearly). This card is a good shorthand reminder if you know the city well, a map companion if you dont. As you are travelling on Sandy Blvd and cross NE 16th Avenue, you are also crossing NE Davis Street, which is the 200 block on 16th. Similarly, in the Foster list, 63 Holgate - 4500 means that as you go down Foster Road and pass SE 63rd Avenue, you are also crossing SE Holgate Blvd, which is the 4500 Block of 63rd. The cards might be available from a cab driver, or you can probably phone Broadway Cab and ask them to send you one. If you don't know what Broadway Cab's phone number is, you should get out more. Here's a challenge: CApitol7-1234. Figure out what goes in place of the C and the A. Don't forget the area code. Please also note, while the Broadway Cab logo is included on these cards this is not to be construed as an endorsement or opinion, one way or the other, on Broadway Cab. Okay, so you just mentioned Biddy McGraw's. You are now my favorite blog of all time. Well, stan, when you're as Painfully Portland as I am, menching places like Biddy's is kinda second nature to me. I accept your anointment with gratitude and honor. [cosmos] Have They At Last Found Persephone? [design] Good Design on a CD ROM? [cult_tv] And Scotty Too, Now...? [politics] Best. Republican. Editorial. Evar.